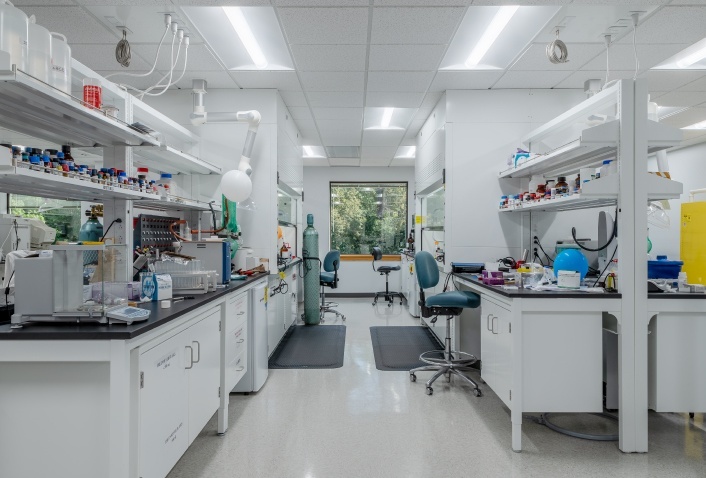 An overlooked area of Biotechnology and Pharmaceutical facility design are the laboratory spaces – not in terms of importance or functionality – rather it’s the softer aspects like workflow and comfort where the extra design consideration can make all the difference. And If designed properly, good lab design can lead to not only greater productivity and cost savings, but happier scientists, as well. 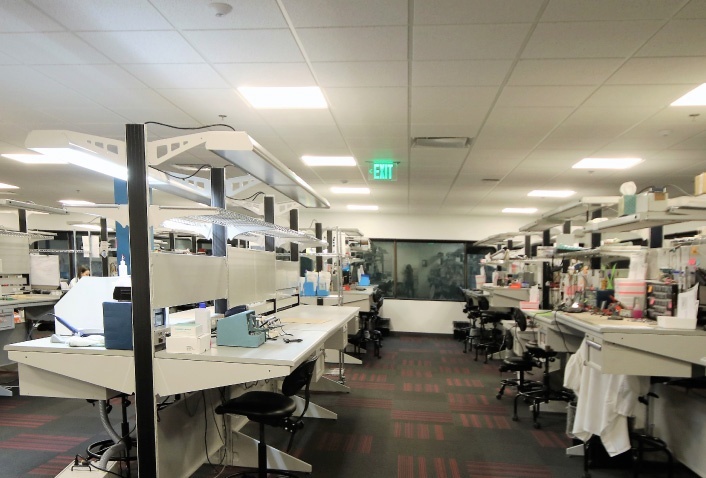 Have a look at some of the ways we optimized the lab space at Spring Bank Pharmaceuticals. 1. Making the Most Out of a Unique Geometry – Lease space often has irregular shapes that present design challenges. Spring bank’s space had the right square footage and location, but a unique geometry. Before ruling out the location, we created a test fit of the program. 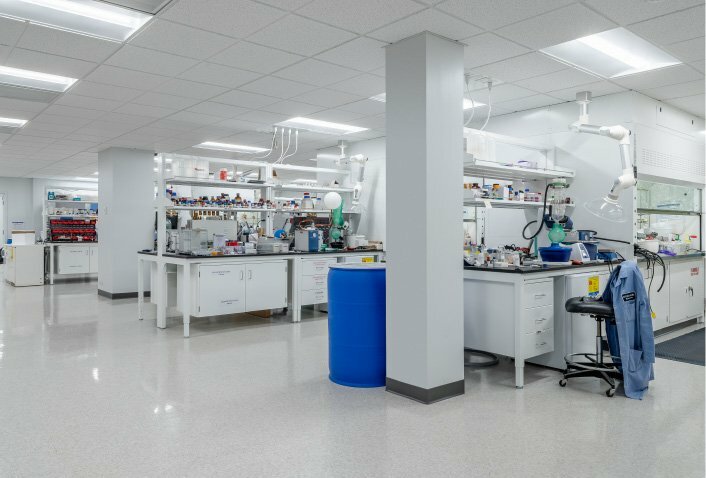 Laboratory space is the most expensive space to build out, so we focused on carving the labs into space aligned with structural bays that allowed for the most efficient layout and correct proportions for casework. The office area was sited within the irregular spaces, which enhanced the design interest and character of the workspace. 2. Optimizing Workflow – Often lab equipment is placed without a lot of thought to efficiency – wherever there is an empty space on the bench is often where equipment is placed. In order to optimize the workflow, your architect must understand the science and carefully plan the space to maximize efficiencies. At Spring Bank, the Maugel design team examined every component and determined its value to the overall process. 3. The Importance of Casework – When planning the layout and placement of casework, we first studied the work zones and traffic flow. It is critical to invest time in the casework layouts – that consideration will result in a highly functioning and ergonomic lab that is healthy and productive. At Spring Bank, fume hoods were placed in fixed locations with modular components tailored for each scientist. Utilities for each hub were placed in the ceiling to provide maximum flexibility. Should the needs change in the future, modular components can be relocated or added without incurring the cost of renovation, a valuable feature for future adaptability. 4. Controlling Costs – Designing for the science is essential. At Spring Bank, we examined every component and determined its value to the overall process. One example was how we treated the design for the fume hood duct work. A “best practice” would be to design a system made of stainless steel. 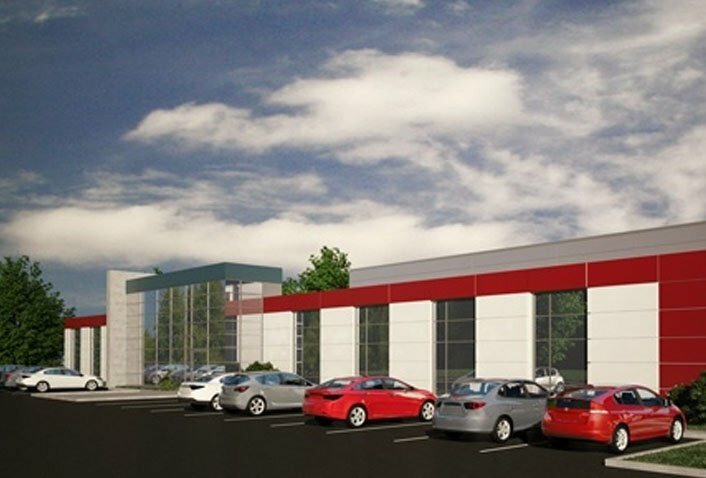 However, in Spring Bank’s case, the chemistry didn’t require that level of durability, so galvanized steel was used, resulting in significant cost savings.